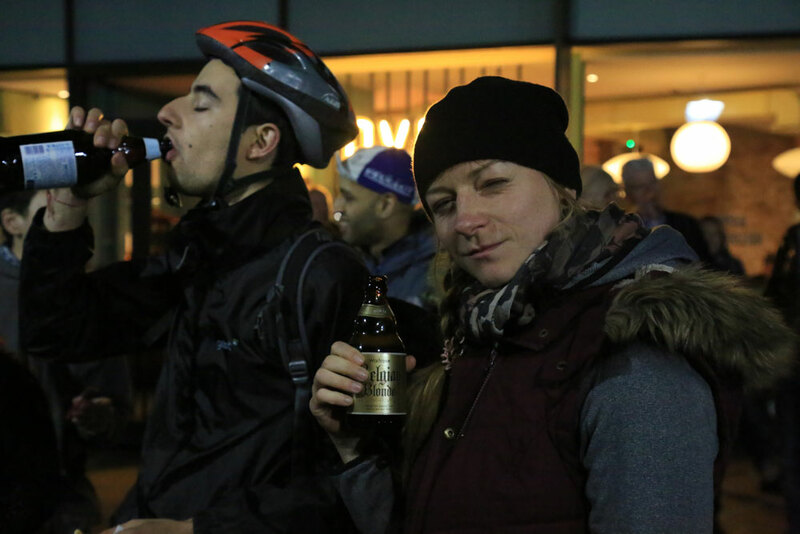 Fixed Beers XIV and our biggest ride so far, staying South-East the route would take us through Rotherhithe, Greenwich, The Isle of Dogs and finally Canary Wharf. Starting with 17 at Cycle PS our number was bigger than usual and would eventually balloon to 21 including the first rider of the year to wear shorts. Summer was nearing and with it the need to head off on time, ensuring we made it through Southwark Park before the gates closed. By 7.40pm everyone had jumped on their bikes. We began opposite Camberwell Grove riding through an estate which landed us on Elmington Road. From there we hung a left down Benhill Road to find Harris St which joined us to Cottage Green and then Well Way. Rather than ride through Burgess Park as usual, we stayed on Saint George´s Way next to Burgess Park as it was still busy and lively in there. We crossed over Trafalgar Ave, rode along the Surrey Canal Path and ended up on Glengall Road. You could feel the good vibes in the group with old and new faces, some enjoying the small roads and twisty route that allowed them the chance to catch up with the main group. The ride, lead by Stephen - a Minirig speaker playing music in his hip-pouch – continued onto Mawbery Road followed by Cooper´s Road, Rolls Road and Oxley Close. We meandered our way through the maze of small roads, and residential areas to join Lynton Road. Turning left onto Galleywall Road we split into smaller groups crossing the roundabout and headed up towards Southwark Park Road before regrouping and then picking up the pace again. With the gates still open we paved our way through Southwark Park emerging by the roundabout outside Rotherhithe tunnel. From there we crossed Jamaica Road before finding ourselves on the cobbled roads that lead to the Mayflower and the Brunel Museum. The pub looked busy so we decided not to linger, continuing on towards Rotherhithe Street. At the Railway Ave we hung a right and crossed Brunel Road following a small path onto Albion Street to join Swan Road and Albatross Way down to the beautiful canal. More cobblestones announced a bridge which we crossed reaching Canada Street and then Archangel Street which would bring us to our first stop, a large purpose built hill, constructed as part of Stave Hill Ecological Park. Stopping for a drink and a much needed rest we marvelled at the view, took some pictures and huddled up for a group shot before we setting off once again. A small dirt path guided us away from the hill and deep into the bowels of the park ejecting us around Greenland Dock. Going around the Dock along Brunswick Quay some people stopped to take more pictures of the fantastic view towards the Thames and Canary Wharf. We stayed as long as possible next to the water before we had to go through Pepys Park and then back onto the road as the path ended. 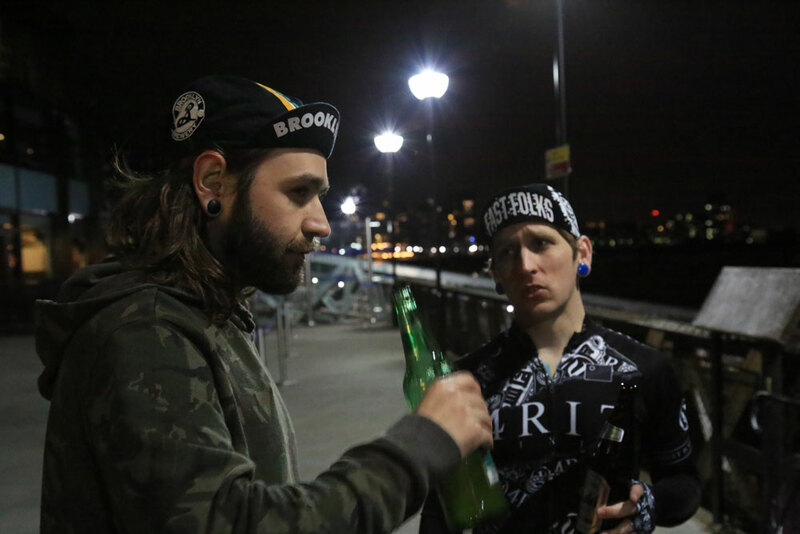 Next was a quick stop as we crossed over our route from Fixed Beers XI where Jewksy had his accident. From there we crossed Grove Street and back to quiet roads like Sayes Cour Street turning into Prince and Watergate Street before Borthwick Street brought us back onto the cycling path and onwards to our next stop: the Cutty Sark. A quick pit stop to get food and drinks then over to Greenwich Pier where we tried to shelter ourselves from the wind will little to no success. Spirits were high despite the strong winds rolling off the Thames. We talked about upcoming events and shared experiences from the year before. 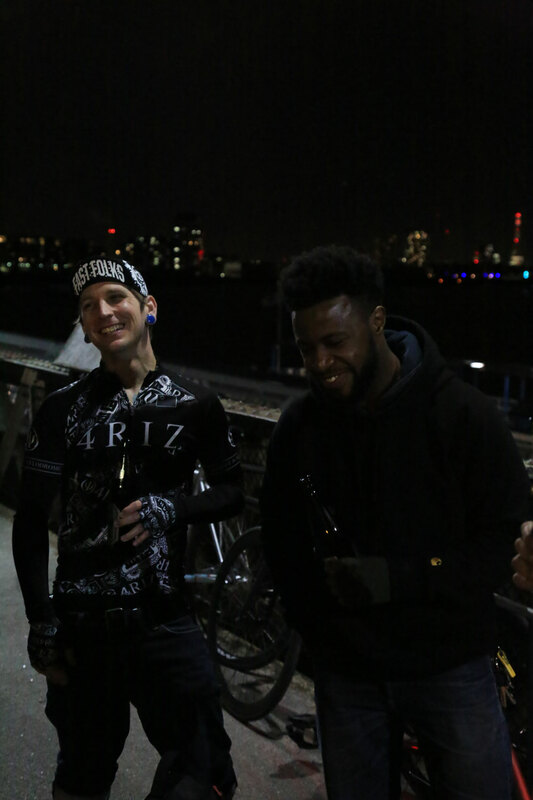 Riding with us this time was John Mack aka MA3K, famous for his rides with St Pauls Fixed Gear and his work with NLTCBMBC. From Greenwich it is was decided that we would share the rest of the route with John offering to take the reigns and lead us along a largely traffic free route to our end point. Refreshed and ready for the off we jumped back on our bikes and tried to fit as many riders in the elevator as possible before descending to Greenwich foot tunnel below. Once on the other side John took over, crossing over Saunders Ness Road and taking a shortcut over to Millwall Park. From East Ferry Road we turned left into Spindrift Ave and right again onto a residential path which brought us towards Clippers Quay. The route was narrow with two of our group attempting to navigate through a tight turn quickly. Both slipped – but luckily weren't injured so we could continued on a little wiser. We crossed the bridge on Pepper Street and went back along Millwall Inner Dock until we hit Marsh Wall. Heading through here John spotted some dangerous street furniture, a low hanging chain, seemingly designed to injure cyclists. We shouted back to the tail end of the group but sadly one rider hit the chain, only hearing our warnings as a co-motion ahead. After a short rest he was ready to get back on his bike. Enjoying the traffic free route we stayed on Thames Quay and took S Quay Footbridge on the other side to Canary Wharf. 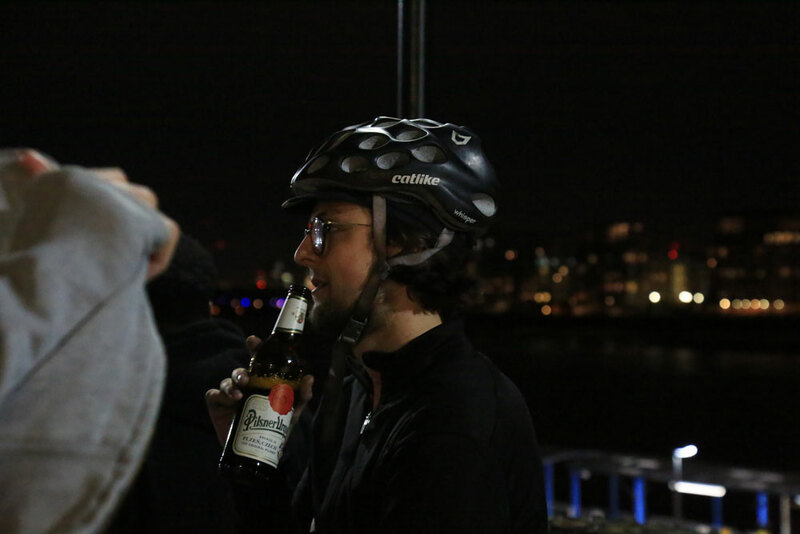 This time our ride ended just around Jubilee Park at the South Dock on some steps, with space to relax prop up our bikes and enjoy a beer. A big thank you to MA3K for sharing his route and Can and all the other riders for sharing their awesome pictures.